How many people have felt the wrath of JJJ… or made him their target? Being the most important truth teller in the City That Never Sleeps cannot be an easy gig. Just look at the reigning champion J. Jonah Jameson. Over the years, he has been the one voice to speak out about the menace of that cursed masked arachnid, the man who ran the paper that took down Norman Osborn, the only mayor to get things truly done since LaGuardia. That makes him a hero to many, but it has made him quite a few enemies over the years too. That history of telling truth to power, even when you hold the power, comes home to roost in AMAZING SPIDER-MAN #14 this February. But who could the person looking to punish our mustachioed hero be? We’ve got the scorecard! Any list must begin with this singular figure. If not for JJJ’s years of heroically portraying the wallcrawler as a covert monster, this so-called “hero” might have been embraced by the public and allowed to complete his true, no doubt dastardly, agenda. Rumor has it Spidey and Jameson have worked together as of late, but we find that utterly unbelievable. Sometimes, in his zeal to punish that weaselly webslinger, Jameson could rush in where angels feared to tread. In other words, mistakes happened. But who amongst has not made a mistake now and then? In this case, the mistake has a name, MacDonald “Mac” Gargan. Mac came to JJJ as a private investigator looking to do his part to reveal Spidey as the baddie everyone needs to admit that masked menace has always been. Jameson, as a visionary, knew that Gargan could not do the job in his present state. So he connected the PI to Doctor Stillwell for an experiment. As a result, Gargan gained super strength, speed, agility, and an incredible costume. For Jameson’s trouble though, did he get hailed a hero and friend by Gargan? No, of course not. Instead, the former PI became a Super Villain too and has had a grudge against the crusading journalist ever since. Once upon a time, Norman Osborn seemed untouchable. A titan of industry with a secret double life as a high-flying terror of the sky, Green Goblin. Jameson made sure to shut down all that nonsense with the power of the Fourth Estate. 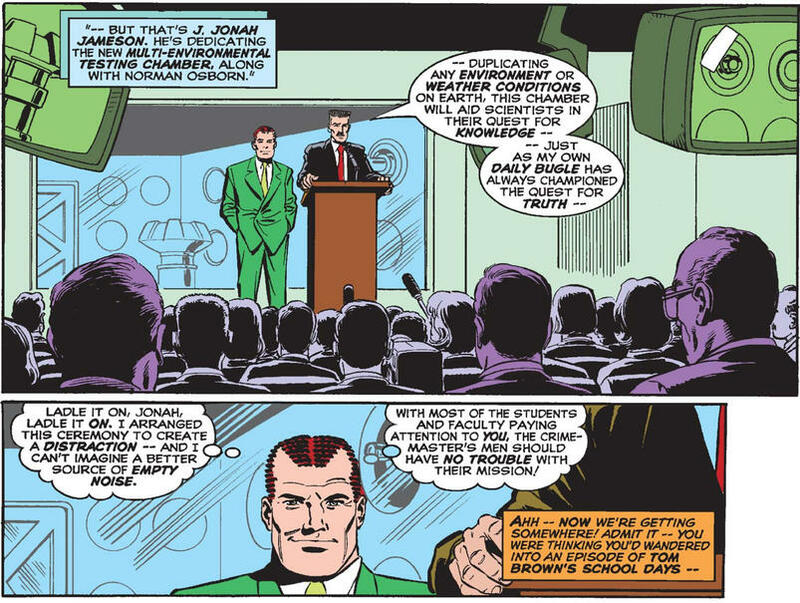 Directing his reporters like the finest of field generals, JJJ exposed Osborn’s double life of crime. As a result, Osborn lost it all. It may have been a short-lived reprieve but that fault lies with the flawed justice system, not JJJ. Even though Osborn has gotten free and been busted multiple times since, we know that cackling criminal bears a grudge. It hardly seems a stretch to imagine this man targeting the hero of New York. Another example of Triple-J’s enthusiasm sometimes getting ahead of his better judgment, Jameson has collaborated with members of the Smythe family on multiple occasions to target Spider-Man with the family’s patented robotic enforcers, the Spider Slayers. Unfortunately, the Smythes proved far more unhinged than the level-headed Jameson and went too far on multiple occasions. He eventually had no choice but to cut ties with them and ensure they went away for a long-time. Given that and their obvious anger issues, we could certainly imagine a known or heretofore unrevealed Smythe attempting to get revenge. This one feels difficult to write but one must explore every possibility to protect the City’s most precious resource. John Jameson, as we all know, is a hero astronaut. He has also, regrettably, been forced to turn into a human-wolf creature by an intergalactic amulet. Perhaps in his irrational, animalistic state, he has allowed his jealousy towards his even more heroic father to get the best of him. It seems wildly unlikely, but then so does anyone wishing to harm the greatest journalist in Big Apple history. AMAZING SPIDER-MAN #14, written by Nick Spencer with art by Chris Bachalo, goes on sale Wednesday, January 30. Pre-order your copy today either online or at your local comic shop!